It’s no secret that real estate inventory is at its lowest point ever. The financial world is still a bit shaky, with banks and other lenders cracking down on home mortgages and payment procedures. What’s a homeowner to do? You need extra room or an upgraded kitchen and bathrooms before the family splits at the seams. There’s an answer for that, so here are the top ten reasons why home remodeling in Maryland is cool! Builders and contractors aren’t quite sitting around playing Texas Hold ‘Em, but they are sitting idle at times. 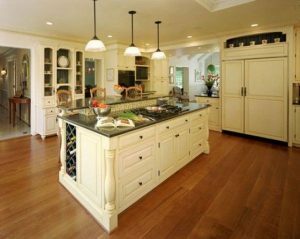 Many are taking remodel jobs for lack of more lucrative add-ons or other building opportunities. Time between jobs is shorter, too, so you won’t have to wait for a contractor to finish a job before he can get to yours. Homeowners will get a better price now than they would have during the boom-time. The real estate industry is assuring us that it’s a buyer’s market out there. However, if the inventory is as low as they say, then moving might not be a good idea. Remodeling will give homeowners the space or the upgrades they need. When it does come time to sell the house, it will be modern and attractive to buyers. Interest rates are low. Homeowners with little to no equity in their homes against which to borrow might take out a loan and get good rates. As long as homeowners have decent credit and a job, they’re usually in. If homeowners have just purchased a home, then making it “yours” would be a good idea before moving in. Make those bathrooms the spa bathrooms of your dreams. Make that kitchen into the room of your dreams. Don’t like where that wall is situated? Knock it down to make a larger space. Need more closet space? Take out one of the smaller bedrooms, add your closet space and use the remainder of the area for a home office, a home gym, a media room or a hobby room. Build bay windows or oriels, build niches into the walls, establish built-ins for the entertainment system, books or your entertainment library. Make it the home of your dreams right now and you won’t have to search for it any longer. Since mankind has pretty well upset the balance of the planet he lives on, it’s a good idea to restore that balance. Pronto. Building a greener home is one of the ways mankind can do that. Using recycled building materials, making sure the windows and doors are energy efficient, sustainable energy sources, energy efficient appliances and other green practices ensure the homeowners’ carbon footprint stays within green limits. Six. I Like It Like That! Perhaps homeowners are already in the home of their dreams, but it could use a little pizzazz. Maybe you hate house-hunting and would rather live in a pup tent than search for another house. No problem. Think about it. You finally have the landscaping the way you want it. Perhaps you put in a pool and an outdoor room a few years ago. Maybe the trees you planted when you bought the house are just now shading the house, thereby helping with the power bill. Maybe the hot pepper plants you planted when you moved in have kept termites at bay all these years. Why would you start all over with these things? The answer: remodel, Maryland! When you bought the house, the floor plan was all you dreamed it could be. It still is. However, the kids are grown and on their way to college. Your elderly parents will need looking after in the near future. Floor plans can be changed to suit your peculiar circumstances. If the floor plan was perfect then, it will be perfect now. Just rearrange some things and you’ll have a floor plan that keeps up with your ever-changing needs. When you bought your house, it was the epitome of style and grace. Mores and styles change over the years, though. The autumn tones of the stoves, fridges and washing machines have segued into functional white. The butcher-block counter that was all the rage back then has turned into quartz and marble. Lighting has changed from the old-fashioned flush-mount fixture into pendant fixtures, recessed cans and focus lighting. Backsplashes are now brick, stone, decorative tile or painted to look like an aquarium complete with fish. You get the idea. Bringing your house into the 21st century is cool. So many rebates and tax credits are available to homeowners who upgrade to energy efficient things that it would be a shame to miss out on all that money. Homeowners who switch to geothermal heating and cooling, solar energy, wind energy and other sustainable energy sources net a decent return come tax time. As mentioned above, energy efficient windows, doors and appliances also sport a rebate or tax credit for homeowners. Homeowners who still have the least distance to drive to work due to the infrastructure in addition to those who are near good schools, entertainment and shopping would be better off remodeling their home. Why find a new house that might not have all these amenities? If the neighbors are still great and the neighborhood still nice, then, by all means, stay put. From the architectural drawings to the consultation before building begins, homeowners will have a say in every step of the remodel process. Our passion and professionalism shows in everything we do. We’ll be happy to tell you more about it when you contact us for more information.